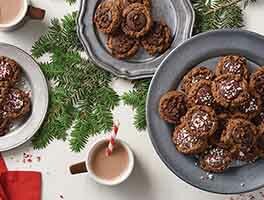 Tender, deep-chocolate cookies with a rich, sweet vanilla glaze, these bite-sized beauties are perfect for a holiday cookie tray or hostess gift. 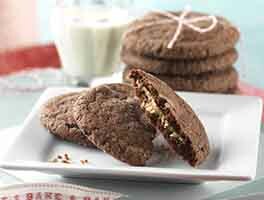 Topped with a chocolate pearl, or bright red cherry, each cookie is a jewel to the eyes and a gem for the tastebuds. Place all the cookie dough ingredients in the bowl of your stand mixer. Beat on medium speed until a soft, smooth dough is formed. Remove from the bowl, and shape into a 3/4" thick disc. Wrap well in plastic wrap and chill for 30 minutes, or as long as overnight. Preheat the oven to 350°F. Line two baking sheets with parchment paper. 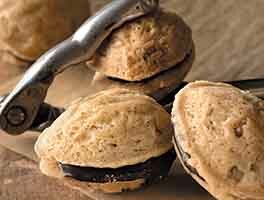 Shape the dough into small balls, about the size of a large gumball (a teaspoon cookie scoop is a huge help here). Space evenly on the cookie sheet, leaving about 2" between cookies. Bake for 7 to 10 minutes. Watch the cookies carefully to avoid scorching the bottoms. 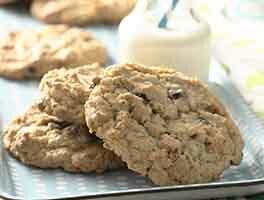 Remove the cookies from the oven and allow to cool slightly on the pans while you prepare the glaze. For the glaze, blend the sifted confectioners' sugar with the heavy cream and vanilla bean paste. This glaze will be thick, almost icing consistency. If you use half and half (or milk) and vanilla extract, the glaze will be much thinner and not as rich. Using a teaspoon, portion the glaze over the barely warm cookies. You can pipe the glaze from a piping bag or zip-top bag with a corner cut off as well. Top with chocolate pearls, slivers of maraschino cherry, or chocolate sprinkles. Store any leftovers at room temperature for up to a week. When making the glaze, heavy cream will give the richest, most creamy results. The creaminess of the glaze is a perfect counterpoint to the crisp, shortbread-like consistency of the cookie. 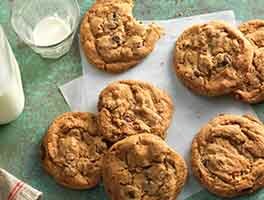 While you can choose to skip the chilling step for these cookies, they'll bake up flatter, and not as nicely domed as when chilled. For festive chocolate-peppermint bon-bon drops, replace the vanilla bean paste in the glaze with 3 drops of peppermint oil, and garnish each cookie with a sprinkling of peppermint crunch or crushed candy canes. This is now a family favorite. You need to put the dough ingredients in a stand mixer and start slow and be super patient. It comes together eventually. So good! Dough was very dry. I measured the flour by weight, not volume. I added about three tbsp. of milk just to get it to come together. It didn't spread in the oven at all, and made little chalky balls. Glaze was also quite dry - 3 tbps extra cream just to get it to a thick paste. I made a single batch of these, weighing the flour to be sure the dough came together properly. I chilled the dough and rolled it into balls by hand, yielding 28 cookies. I baked for about 12 min. (my oven is slow) until the dough firmed up. The result was little domed cookies. I made the glaze with heavy cream and vanilla bean paste, and that was at least twice as much as I needed to drizzle across the cookies. (Waste like this always drives me crazy!) In the end, I'd rate the cookies as okay but not great. I'll note that if you want your cookies to look like those in the photo, you might not want to chill the dough, and you'll want to use the peppermint flavoring in the glaze since the vanilla bean paste produces an off-white color, rather than sparkling white. I made these under the supervision of a very experienced baker friend of mine. We followed the instructions and measurements to the letter, but no dough was formed. It was a delicious-smelling chocolate powder in the mixer. We had to add a little heavy cream to get the ingredients to bind. We chilled the flattened dough for an hour, formed the balls and baked as directed, about 9 minutes until the cookie "bounced back" to the touch. The flavor of the cookie is quite excellent, but the texture is dry. We were both very confused by the amount of dry ingredients vs. liquid. What could we have missed? My dough didn't really come out smooth and soft. It was hard and difficult to scoop out the cookies. I also found them to be a bit salty. That said, I will make this recipe again (reducing flour or adding milk to dough and less salt). The cookies were good and really have the potential to be great. If they would have scooped out easier (I tried chilled and at room temp) they would be the perfect cookie for exchanges when you need 6-8 dozen cookies. Easy, good and pretty. These are lovely. I took them to a cookie exchange & everyone raved over them. I just have a question for KAF: I want to make this with the mint glaze suggested in the tips section, but I only have mint extract (no peppermint oil like the "tips from bakers" suggests). How much mint extract do you recommend using to substitute for the 3 drops of peppermint oil? Try using 1/4 teaspoon of extract. Frank @ KAF. 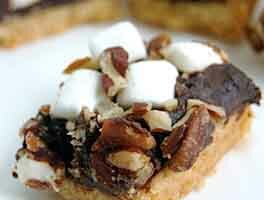 Great little cookie and so easy to make a double batch!! perfect! These won me first place at a cookie swap! Everyone LOVED them!